Normally a new product by Sony is released in Japan before other markets, but Sony is in a mood for change as it has released the ‘NW-A800’ Walkman series in the UK. Starting with three models NW-A808, NW-A806 and NW-A805 all of which share the same features except the storage space. The A808 packs in 8GB flash memory whereas the A806 and A805 have a modest 4GB and 2GB of space. Featuring a 2 inch (240 x 320) LCD display it supports playback of H.264 / MPEG-4 AVC files as well as popular audio formats including MP3 / WMA / AAC / WAV along with Sony’s favourite ATRAC3 and ATRAC3plus. Jpeg images can also be viewed on the bright and colorful screen. The onboard Lithium Ion battery is good for 30 hours of music and 6 hours of video playback. 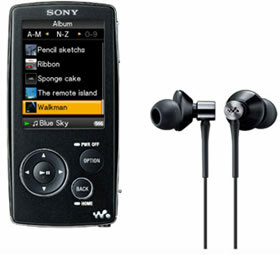 Bundled with Sonic Stage ver 4.3 the NW-A800 Video Walkman measures 88 × 44 × 9 mm, weighs 53 grams and is available in blue, black, white and pink. Available in UK for now (wonder when it will cross the Atlantic) the NW-A808 (8GB) sells for £200 ($ 400), NW-A806 (4GB) for £145 ($ 285) and NW-A805 (2GB) for £120 ($ 235). Very expensive when compared to the iPod as the 8GB Nano sells for $240 and the 80GB video iPod sells for just $350. But again the 80 GB Video iPod sells in the UK for £259 or $520.